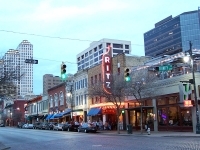 The largest of the many live music events for which Austin hosts, is the annual South by Southwest festival, held at more than 50 venues around the city and draws performers from around the world. The festival started in 1987 as an extension of the New Music Seminar in New York City, and has since grown and become entirely its own entity. The festival programme includes 1,000 performances on more than 50 stages over a six-day period. In recent years the festival has expanded to encompass film and multi-media, both these categories now forming separate extravaganzas to make South by Southwest a convergence of entertainment and media. Over the years, the festival has led to the discovery of many musicians, such as John Mayer, James Blunt, and Hanson, and a new film genre, mumblecore, was reportedly coinded at South by Southwest. Venue: Various venues, see website for details.